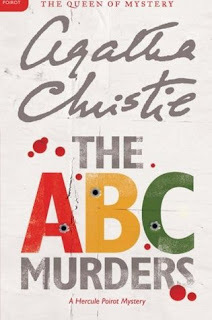 I mentioned in my last Agatha Christie review that it made me want to read more of her works. I have three more with me and I decided to start with this one. Mystery! While reading through the first chapter of The A.B.C. Murders, it made me think that Agatha Christie's murders are completely set up - it's well planned. Comparing this with the first two I've read, it begins with a letter, exploration of what to expect, the murder, and so on. She follows steps. With that in mind, I just read through. I thought I'd get bored since I'm expecting things but I was stand corrected. I was completely absorbed. I find it really difficult to put down. Hercule Poirot receives a letter taunting him and telling him a murder will happen. On the set date and place, a murder did happen. Solving the Case. What's really exciting in here is how the culprit cleans his mess up - he doesn't leave any finger prints, and he sees to it that he goes unnoticed. He really made me think hard how he does things, how he slips in and out being unnoticed. As more murders happen, I find it really interesting that the relatives and other people close to murdered people come together. I enjoyed the differences of their personalities and how Poirot makes them recall things and plainly react to things he says and asks. I find the final act, the Doncaster murder, to be very thrilling. Everyone's on the lookout for the culprit - includes the police, the relatives and friends of the murdered, the murder has a description, there was an actual witness, there were several chapters dedicated to other point of views aside from the main narrator. The narrator, Captain Arthur Hastings is not a very interesting man. I don't see him working his mind out for the solving of the case but Poirot does get things from him - ideas. Hastings' quick responses give Poirot ideas. Hastings point of view finders the reader from completely knowing Poirot's ideas and deductions. Reading through in such a perspective is a bit frustrating but I guess it helps build up the excitement. It makes me wonder what goes through the detective's mind. Revelation. Why the culprit did it is the biggest question I had as I read. And should I say, he's such a careful and well organized man! He really had me thinking. He crossed my mind for a bit there but Agatha Christie really made me believe that it was not him, that it was someone else. OVERALL, The A.B.C. Murders is a thrilling detective mystery that really had me thinking. It's got a very engaging mystery, an exciting pace, and a great twist. It was wrapped up nicely with a great explanation by Poirot of a really elaborate murder. It's a MUST READ for mystery and detective novel readers.